The information is from Trudy Talbot the Bullmastiff Breed Council Breed Health Co-ordinator. 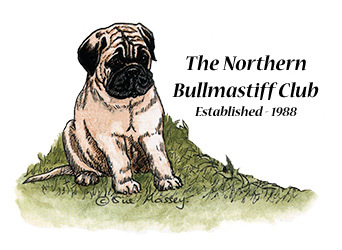 With the support of the Kennel Club we have been steadily working towards improving the overall health of the Bullmastiff as a breed. Advancements in genetic coding will soon allow us to identify genetic anomalies within the Bullmastiff gene sequence. This will allow breeders to actively screen out any health problems that may arise within their breeding programmes, which in turn we hope will improve the overall health of the breed. Like most breeds the Bullmastiff does have a few health problems. Cancer (in various forms) – this includes lymphoma. The Bullmastiff Breed Council, with the help of our breed clubs, have organised health seminars to disseminate information to owners and breeders. We have also designed health surveys, the results of which feed in to our overall breed health programme. 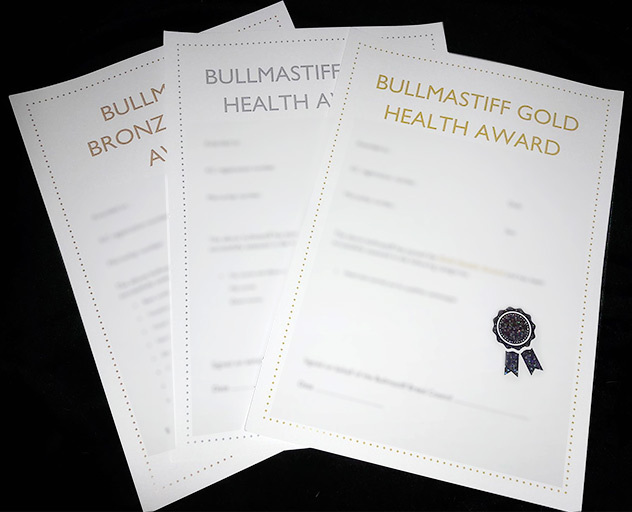 We have now put together a Bullmastiff Health Award Scheme which comprises of 3 levels of award – Bronze, Silver and Gold, the scheme isn't designed to restrict breeding just to demonstrate that the Bullmastiff community as a whole are in favour of promoting good health. Over the past few years we have worked really hard to improve the health of our breed by the use of education and new technologies and we will continue to work with just as much commitment in the future with the aim of having a breed of working dog that is fit for function and fit to be a loving and healthy part of any family. The scheme has been set up to establish the current health of the Bullmastiff population by encouraging health testing using established tests. It is hoped that in the long-term this will help to improve the overall health and welfare of the breed. Of the three awards, Gold relates to heart testing, Silver to hip and elbow scoring and Bronze is a general health check which can be done at your vets. For each level of testing all dogs will have their microchip scanned by the vet and it must correspond with the details on the form provided for the appropriate award level before the examination can begin. Basic auditory check of heart and lungs. Visual/auditory assessment of dogs breathing A) at rest & B) after 5 minutes of exercise. Visual assessment of skin and ear canals. Normal clinical assessment of eyes. Check for normal tail formation. Check for normal testes in male dogs. Temperament (Can be carried out by either a vet, a behaviourist or a qualified veterinary nurse). Hip scores and elbow scores. Heart test carried out by approved Cardiologist. If you are considering breeding from your dog and would like to join the scheme, the relevant paperwork is available on request, via email from Trisha Cox Billandtrish@btinternet.com. Once the dog has passed the assessment and relevant paperwork is completed and returned the Breed Council will issue a certificate. The only thing they ask is that the postage for the certificate is covered by the potential breeder.